Following House Intelligence Committee chairman Rep. Devin Nunes’ threat to hold the Justice Department and FBI in contempt for stonewalling its investigation into the ‘Trump dossier,’ it has been agreed to allow investigators to grill the agent linked to the author of the dubious document. 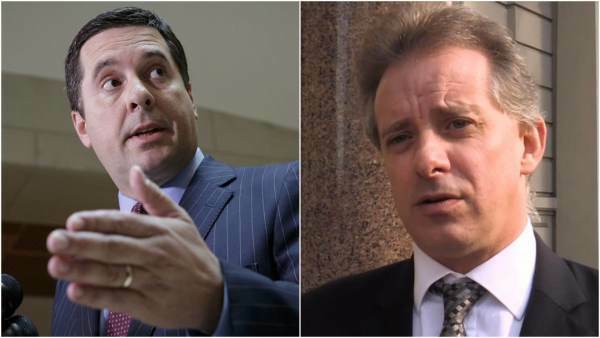 Fusion GPS ‘spy,’ and former British intelligence operative Christopher Steele is widely credited as the dossier’s author. Indeed, mere hours before Fox News ran its story Wednesday evening, Deputy Attorney General Rod Rosenstein — who has stepped into the shoes of Attorney General Jeff Sessions after he recused himself from all matters related to the FBI’s Russia investigation — had been on the phone with Nunes and agreed to permit House investigators to interview FBI Deputy Director Andrew McCabe as long as he’s not questioned about special counsel Robert Mueller’s ongoing Russia investigation. The FBI agent in question has not been identified. As The Gateway Pundit’s Jim Hoft reported, for the past several weeks, top FBI operatives, including Rod Rosenstein and Director Christopher Wray, have stonewalled in producing material related to the Russia-Trump probe to Congress. Lawmakers are preparing contempt of Congress resolution against Deep State operatives for refusing to release material related to their Trump probe to Congress. “Nunes and other committee Republicans, after considering such action for several weeks, decided to move after media including the New York Times reported Saturday on why a top FBI official assigned to Special Counsel Robert Mueller’s probe of Russia-Trump election collusion had been removed from the investigation,” reports Bloomberg. According to the Washington Post, the FBI agreed to pay the British Spy who compiled the garbage dossier after the election to continue to dig up dirt on Trump and Russia. The FBI pulled out of this arrangement once the author of the dossier, Christopher Steele was publicly identified in media reports.